On Jan. 4, WDFW staff were informed of dead livestock by the Stevens-Ferry County Wildlife Specialist on a U.S. Forest Service grazing allotment in Ferry County. The livestock producer and ranch staff were actively looking for a few cow-calf pairs remaining on the allotment along the Kettle Crest. The carcasses were discovered through investigation of wolf location information provided to the livestock producer by the County Wildlife Specialist. The carcasses were within the OPT pack territory. The producer who owns the depredated livestock is the same producer that experienced wolf depredations by the OPT pack in 2018. The carcasses were discovered northwest of the allotment where the 2018 depredations occurred. On Jan. 3, the producer searched the area of the reported wolf location information and discovered one live cow and two calf carcasses. The live cow was removed from the area by the producer and was reported to have no injuries. Due to the remote location of the carcasses and lack of daylight, WDFW staff could not reach the area to investigate the dead livestock until Jan. 5. During the investigation of the carcasses initially reported, department staff found and conducted an investigation on an additional cow carcass discovered in close proximity to the others. In total, staff investigated and confirmed three wolf depredations. The three carcasses (two calves and one cow) were within 850 meters of one another. Investigation of the first calf revealed partial consumption of the internal organs and back half of the carcass. External examination of the hide indicated bite lacerations and puncture wounds on the right and left hindquarter. Lacerations and puncture wounds were present on the inner and outer portion of both legs. Skinning the carcass on the left and right hindquarters revealed hemorrhaging of the muscle tissue. The remains of the second calf included the vertebral column and two front legs attached to a piece of hide. All of the soft tissue except the remaining hide had been consumed or removed, and the ribs and one of the long bones had been chewed and broken. There was evidence on the hide of significant hemorrhaging in the left armpit of the calf. The investigation of the cow carcass revealed significant wounds and consumption of the soft tissues of the head and puncture wounds above the hock on the left rear leg. Skinning the leg revealed significant hemorrhaging and tissue damage immediately underlying those wounds. The damage to all three of the carcasses investigated was indicative of wolf depredation and wolf tracks were documented at each site. In addition, GPS data from the radio-collared wolf in the OPT pack showed he was in the immediate vicinity during the time of the incidents. The data were also consistent with the age of tracks found at the site during the investigation. The locations and sign further suggest that the wolves involved in the depredations remained in the immediate vicinity for about a week. No proactive wolf deterrents were in place because cattle were presumed by department staff to be off the grazing allotment. The vast majority of the livestock had been removed almost two months earlier. Deep snow (24-40 inches), avalanche conditions, and the distance from vehicles (more than 10 miles away) prevented WDFW staff or the livestock producer from removing the carcasses or deploying other responsive deterrents. No other livestock were detected in the area. Previously, the OPT pack was implicated in a total of 16 depredations (13 injured and three killed livestock) in under two months. The additional depredations bring the total to 19 depredations (13 injured and six killed livestock) since Sept. 4, 2018. On Nov. 13, WDFW Director Kelly Susewind paused action seeking to lethally remove the two remaining wolves from the OPT pack that repeatedly preyed on cattle in Ferry County. WDFW staff previously attempted to remove the remaining two wolves in the pack multiple times over a two-week period, but were unable to locate the uncollared pack member due to the dense forest canopy. Director Susewind is now reassessing this situation and considering next steps. The Colville tribe opened up wolf hunting for tribal members. I was unaware they had a wolf season, but they did and now it is year round. mismanagement of public money at its finest. $1000 per head bounty in Idaho? Not exactly easy money but it's possible. The traps and gear will set you back a couple thousand dollars, and driving or snowmobiling a circuit of more than 50 miles several times a week from November through March gets spendy, not to mention the time. 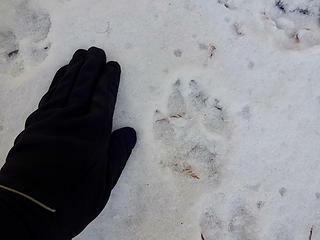 I do most of my hiking in north Idaho now and it's rare that I don't see wolf tracks in the snow this time of year. I don't buy that the elk population is suffering due to depredation as some claim. I see plenty of elk tracks too. I passed about 200 head out in a field the other day munching on some bales of hay. Methinks too big for coyote. No sign of vehicles or other human activity in the area either. Wolfy? Timberghost, there's something about that story that just seems totally bogus. It doesn't make sense that wolves would expend that much energy (in winter!) on "joy killing". I'd like to hear what a wolf expert would have to say about it. I watched a national geographic show just recently on wolves and cougars. Their dpcumentary said that from time to time wolves will kill many of their prey in order to train younger wolves in the pack. I am not saying that for sure that is the case here. They likend it to honing up on their skills. One has to remember these are wild animals and not Frisky your pet hisky. They kill to survive or kill to eliminate any competition. The wolf man of Alaska has some of that mentioned in the book about him. Dogs will do it, so I I imagine wolves will too. Thinking they don't is kind of the same as thinking that wild animals will stay inside land ownership boundaries. A welcome development. Away from east-side cattle on public lands and into the wild. What makes you think they stay on public lands? This week there were reports of wolves in a yard (private land) east of Twisp. Animals have no concept of land ownership. Also, during the winter, calves were killed or gravely wounded on private land in the NE part of the state.